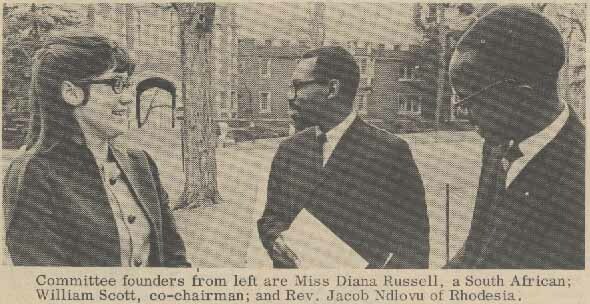 This photo shows three members of the New Jersey Committee on South Africa, Diana Russell (left), Princeton University graduate student from South Africa, William Scott, and Rev. Jacob Ndlovu, graduate student at Princeton Theological Seminary from Rhodesia (now Zimbabwe). The group that founded the Committee in November 1965 consisted of Princeton University graduate students William Scott, John Gerhart, Nathan Shamuyarira, and David Wiley. The photograph appeared in the student newspaper, The Daily Princetonian.